PAUL COOK warned Pompey may need to change their ways to avoid home discomfort. And the Blues boss has called on supporters to stick with their players in the face of the test posed by Stevenage tomorrow. Cook has tasked his side with maintaining the level of performance produced in the win at promotion rivals Luton on Tuesday evening. But he is anticipating it could be a very different challenge against Boro at Fratton Park. 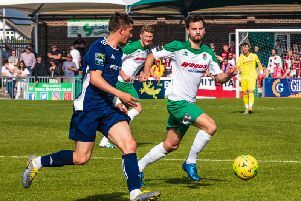 Darren Sarll’s side may be one of the more unfashionable names in the game, but they arrive on the back of three consecutive league wins on the road. Cook feels the game may lack the gung-ho qualities seen from both sides at Kenilworth Road in midweek. He said: ‘Pain is coming. There is going to be a bit of pain along the way. ‘I knew on Monday we’d enjoy Tuesday. I can’t say the coming games will necessarily be like that. So we have to make sure we adapt now. ‘The game on Saturday may be totally different to Luton. There’s every chance. That’s the way it is. That’s football. ‘That’s why you can’t necessarily say we’re not keeping up the level of performance. ‘We have to be prepared to adapt. We want to evolve. ‘On Tuesday we had two managers who believed they’d win with their style of play. ‘We’re not going to keep turning up and playing well. ‘We need to find a way. Without a shadow of a doubt. ‘We have to keep going and believing in what we do. ‘It’s important we take our chances. We’ll get chances, for sure, if we’re at it. It’s important we convert those chances. ‘We’ve got good players, we’re a good team and well respected. But people will try to stop us winning the game in the way we want it to be. ‘It’s habits. Our players are well educated in how we want to play now. ‘Every now and again you need a performance like Tuesday. It buys you credits. The fans will go away talking about it. Pompey return to Fratton Park tomorrow for the first time since there were boos in the 4-0 win over Mansfield. Cook knows having the backing of the Fratton faithful is going to be a key factor, especially if Stevenage prove a tough side to break down. ‘The supporters don’t want to boo us, they actually want us to win. There’s a difference in that,’ he said. ‘They want us to be their heroes, but we have to win to do that. ‘But for us to do it they also have to be strong. They have to be strong for the players who have received criticism. ‘The more we stick together the stronger we’ll be. That’s the reality of it.